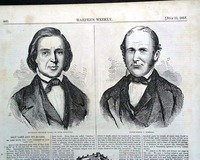 THE DAILY SPRINGFIELD REPUBLICAN, Springfield, Massachusetts, dated July 9, 1862. 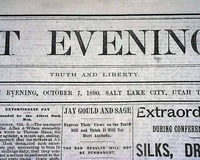 DESERET EVENING NEWS, Salt Lake City, Utah, June 23, 1886. 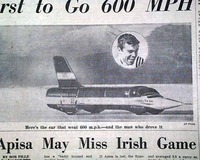 DETROIT FREE PRESS, Michigan, November 16, 1965. 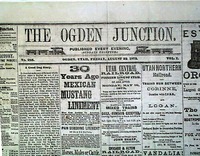 Page 5 letter to the editor: "Pikes Peak" "The Alleged Frauds At Pikes Peak & The Charges Against Mr. Greeley". 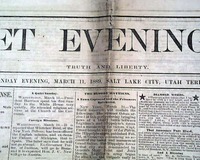 Other news of the day includes: "News From Utah Territory" "Fires" "Probable Murder" and much more. 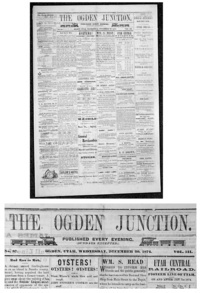 Several interesting advertisements as well. 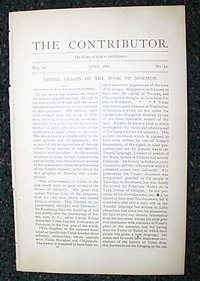 8 pages in good condition. 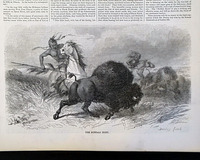 Buffalo Bill served under General Washington...? 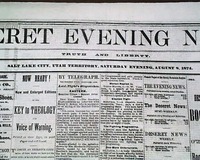 DESERET EVENING NEWS, Salt Lake City UTAH -August 8, 1874. 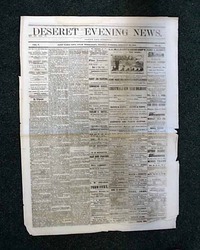 DESERET EVENING NEWS, Salt Lake City, Utah Territory, 1890 A rare issue from Utah. 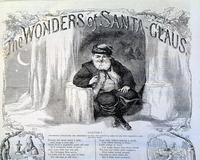 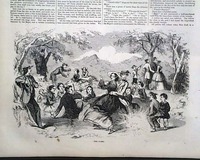 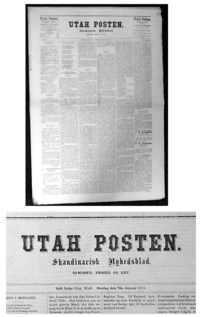 DESERET NEWS, Salt Lake City, Utah Territory, 1872. 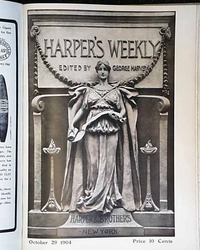 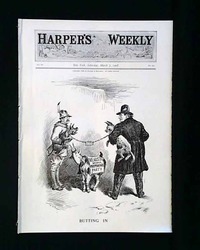 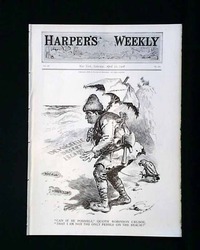 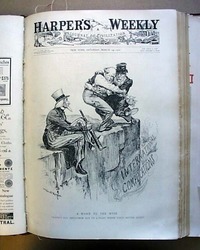 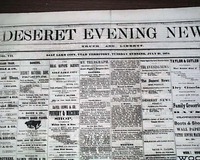 A rare and very early issue from the old West in Utah. 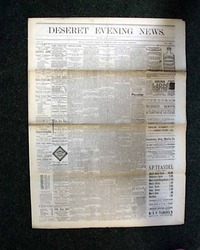 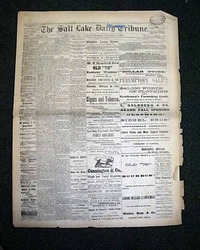 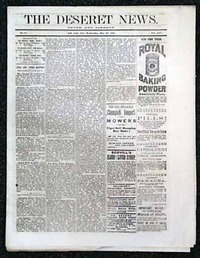 DESERET SEMI-WEEKLY NEWS, Salt Lake City, Utah Territory, 1890 A rare issue from early Utah. 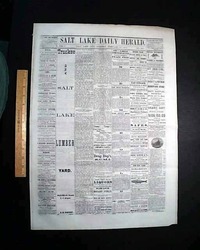 SALT LAKE CITY HERALD, Salt Lake City, Utah Territory, 1874 A rare and early issue from Utah. 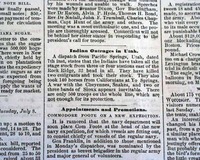 SALT LAKE DAILY HERALD, Salt Lake City, Utah Territory, 1871 This 4 page newspaper has news of the day with several interesting advertisements. 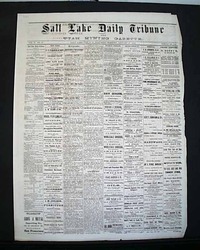 SALT LAKE DAILY TRIBUNE, Salt Lake City, Utah Territory, 1876 A rare issue from early Utah. 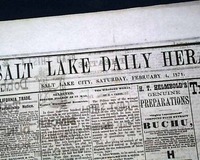 SALT LAKE SEMI-WEEKLY HERALD, Salt Lake City, Utah 1872 A rare and early issue from Utah. 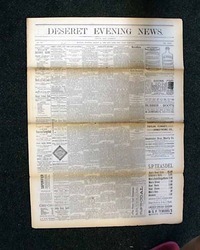 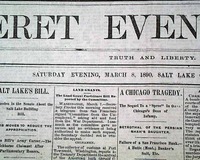 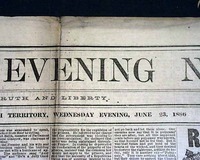 DESERET EVENING NEWS, Salt Lake City, Apr. 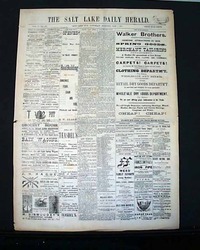 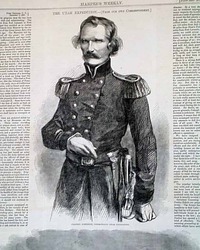 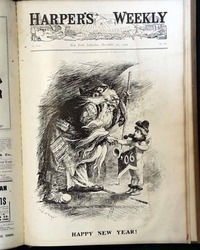 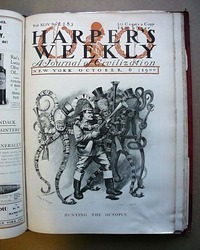 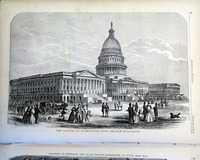 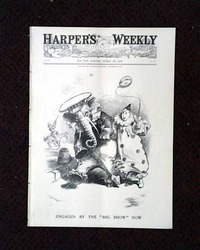 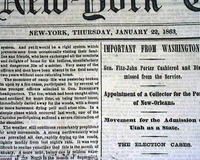 28, 1886 Ftpg: "Jeff Davis Receives an Ovation" is a report from Montgomery, Ala. 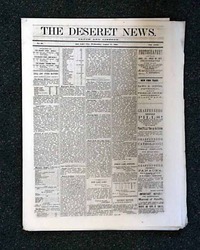 Uncommon newspaper from Utah. 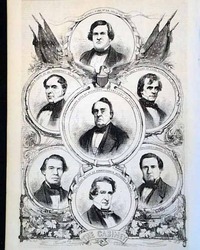 HARPER'S WEEKLY, New York, April 11, 1857 Nice full page shows: 'The Cabinet' of President Buchanan, with displayable portraits of the seven men and accompanying article. 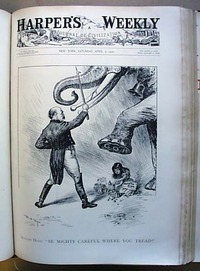 Several illustrations regarding the war between Persia and England. 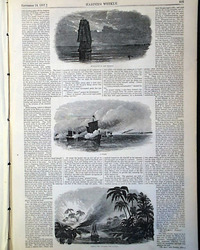 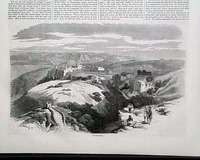 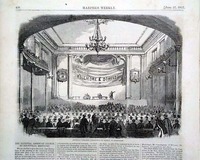 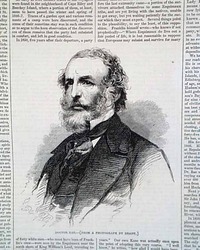 HARPER'S WEEKLY, New York, May 2, 1857 Two half page scenes showing the 'Niagara' laying the telegraph cable across the Atlantic Ocean, with the accompany article: "The Laying of the Transatlantic Telegraph" and small illustration of Professor Morse among others. 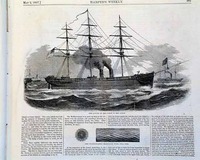 Also an illustration: "The Transatlantic Telegraph Wire, Full Size". 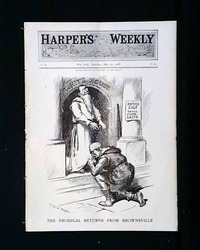 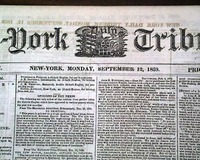 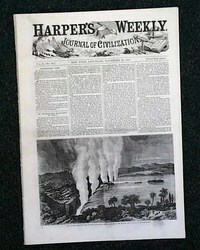 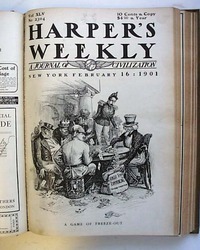 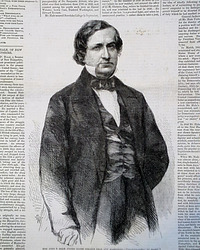 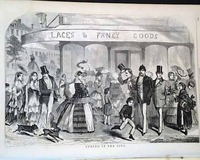 HARPER'S WEEKLY, New York, June 20, 1857 The full front page features "Prince Frederic William of Prussia, and the Princess Royal of England" which also has an inside accompanying article.